Rules are meant to be broken, and I’m still learning. In my last post I gave you a quick tour of my studio and the tools that I use. And while that was important for the setup we’re still a long way from the actual sculpture. Certain rules should not be broken, and the important one is following a plan, a sketch, or a model for sculpting a larger magical creature. By large I mean more than 1-2 inches given my tiny scale of choice. While I have a basic idea of the creature I want to create, I have to take 2 important things into consideration. 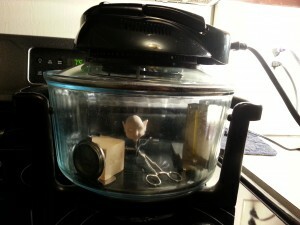 I use a Deni table-top convection oven which I dedicate for clay only. This gives me that healthy and safe separate between food and clay. The oven is about 12 inches in diameter but only gives me about 4 inches in height. This limits the height of any seated creature I sculpt, but I can sculpt a larger critter and simply bake it on its back or side. The more complex the stance or pose of my sculpture, the more internal support (armature) will be required, and thus the more difficult this will be to complete. With this elf sculpture, I’m looking to work on a faster scale, and hopefully finish her in a matter of days instead of weeks. Knowing me, it’ll still probably take a few weeks. 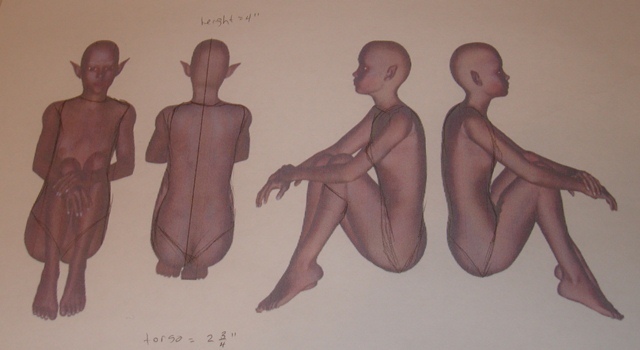 Taking the above into account I have chosen to sculpt my elf on a 1:10 ‘scale’ and seat her on a flat surface. A scaled sculpture is one that is crafted with similar proportions to a life-size model, but on a smaller scale. Just imagine looking at a 4×6 photo of a person you know. The features are the same, but everything appears much smaller. My 1:10 sculpture will be about a tenth of the size of a human-sized elf. Her human counterpart would be 10 times as tall. But even within the 1:10 scale, a magical creature does differ from a real human, and so I will let her ‘speak to me’ as she comes to life in polymer clay. For example, I will likely give her a larger head and very large ears to capture the childish essence of her magic. I typically work from random models or envision my own pose. However, this sculpture is more complex than anything I’ve tried in the past. And, since she’s my very first full document sculpture within my sculpt-n-blog I will keep her straight-forward. Using my online Magical Modeling Agency – MagicSculpture.com, I have chosen a pose that fits nicely with the elf I have envisioned. I especially love the 3-D feature of Magic Sculpture that allows me to rotate the model so that I can see every feature from every angle allowing for a dynamic inspirational guide. I’ve printed a few of the basic poses as pictured above, and will use the 3-D version to rotate on my screen for additional guidance. Polymer clay is a very soft medium to work with. And like human flesh it requires a strong skeleton for structure and support. The internal skeleton of my clay sculpture is called an armature and will be fashioned from a combination of steel wire and aluminum foil. In addition to locking the elf in her desired pose, the wire will help keep her features in place, and the foil will provide internal bulk which minimized the overall thickness of the clay used. 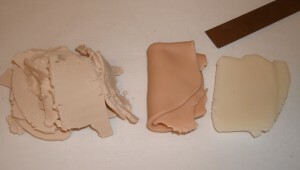 The thicker the layer of clay used, the longer the sculpture will required to bake. This in turn increases the risk for scorching and cracking. Thicker layers of clay also risk not baking all the way through which may cause the sculpture to crumble and break down in the future. I design my armature with these 2 thoughts in mind. I start with a thick ‘main’ armature to follow the shape of the head and torso. 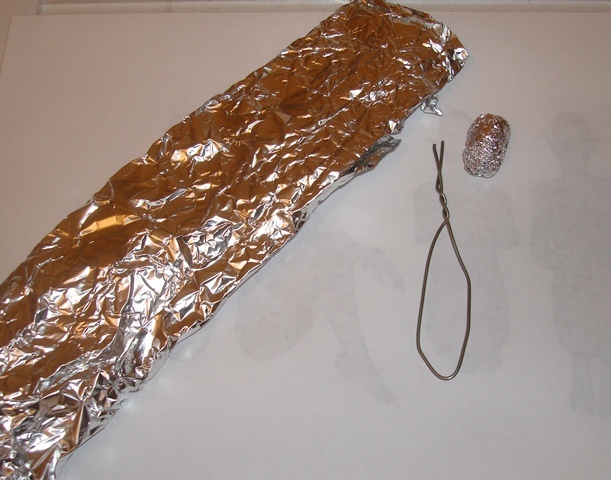 I then add foil to the bulky areas where the elf will be thicker than 1/4 to 1/2 inch. The head and torso will be the thickest part of the sculpture and so I create a foil core for both areas to build upon with clay later on. I crumble the foil and then squeeze it on to ensure that it holds onto the wire yet doesn’t get too dense. 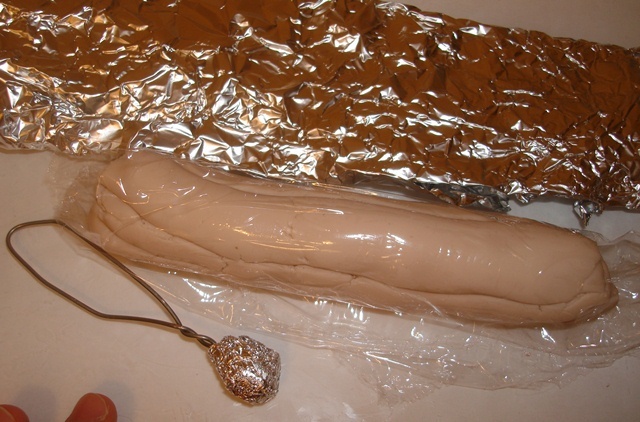 The roughness of the crumbled foil will allow the clay to attach more securely later on. 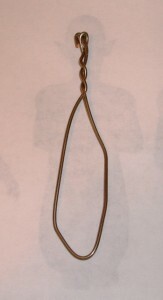 The head will be egg-shaped and about 1 inch tall so I add foil to the wire that is slightly smaller in size. Since my sculpting skills are still progressing, and since the face will be the most difficult portion, I don’t add the body foil till after I finish sculpting the face. 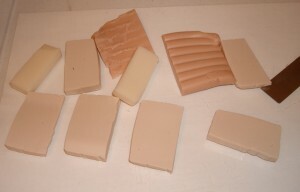 There are many different types of polymer clay. The key is to experiment with them all and choose your preferred brand. I personally like to work with Premo Sculpey when creating small figurines, especially when colored clay is required. For humanoid magical creature I like to use a mix of Premo Sculpey, Original Sculpey, and Sculpey Living Doll. Perhaps in a future post I will break down the differences. Original/Super Sculpey: This is a very soft and very easy to use clay. With an intermediate flesh tone, this can be used right out of the package. I recommend this for beginner sculptors working on larger features. The clay is soft and so will not be ideal for mini sculptures and great detail, but the softness does allow for great flexibility and quick ‘fixing’ of errors. 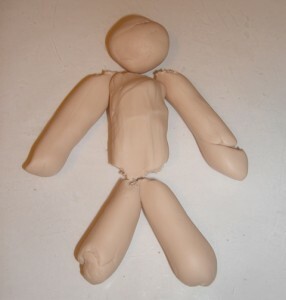 Sculpey Living Doll: This is a bit of a tougher and less forgiving clay. Ideal for the more advanced sculptor, this clay is great for creating tiny creatures with plenty of details. 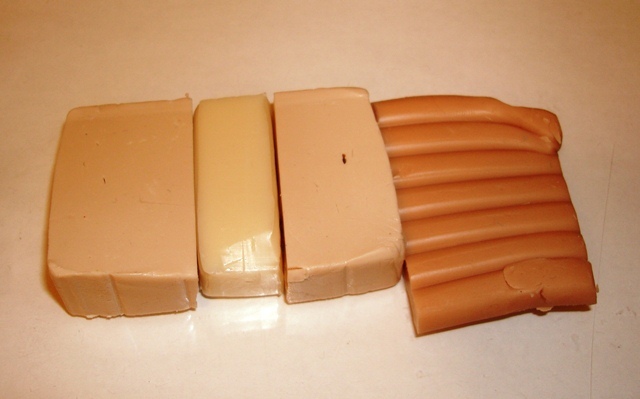 It’s a bit tougher to work with at first, but does come in a 3 great flesh tone colors. Premo Sculpey: As I said, this is my favorite brand of clay. The clay is not very soft but still workable. It holds great detail and comes in a ridiculously large variety of color. Premo usually comes in just 2 ounce packages making it less ideal for a complete large sculpture. Premo has a beautiful slight-shine finish. So… to come up with an ideal elf mix, I just take a bit of each and mix them all together. This gives me the color, workability and ‘toughness’ for my sculpture. I don’t have a color recipe, so I just guesstimate until I am satisfied with the results. Then, for kicks, I mix in some premo translucent. I don’t have a real reason, I just love the color and it gives my creatures a slight translucence to their skin. Premo also bakes to a very nice and shiny finish. 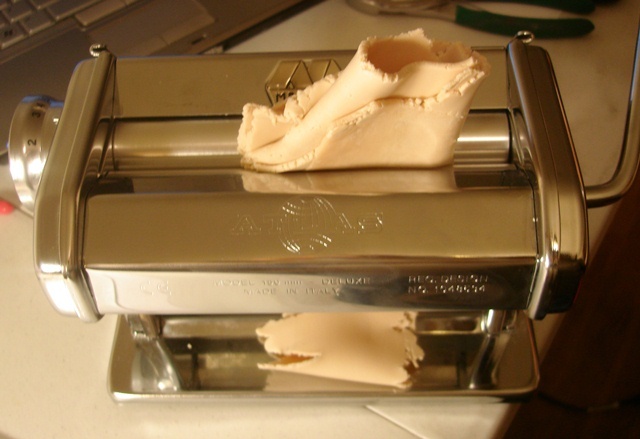 To mix the clay, I slice all the components thin enough to fit into my pasta roller machine. I then run them through a few times to soften and condition the clay. Once conditioned I run the colors through together again and again till they are perfectly mixed. If you’re interested in seeing a color-mixing tutorial just let me know in the comments below. Since I’m not following a pattern or guide, I simply guesstimate how much clay I’ll need for each body part. I’d rather mix too much than run out mid-sculpture.